We've been doing a lot of work with Facebook ads with clients lately and have found that they're of really good value because of their targeting ability. 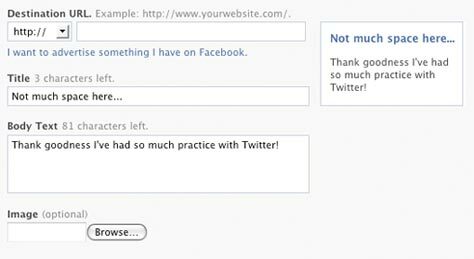 As an introduction to how to run a Facebook campaign, here's a fun project I did for my personal blog. Facebook has an incredible database of accurate personal information that allows you to target a very specific group of people, particularly young adults (although this is becoming increasing less true). 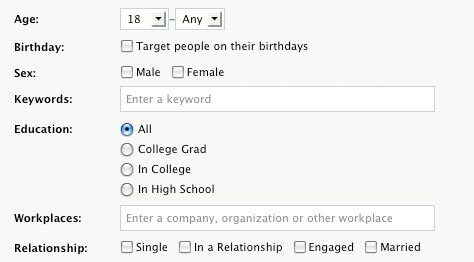 When you're looking to target a group of people based on their interests, location, age, education, workplace, relationship status, or connections (and who isn't? ), Facebook is a good way to go. My target audience is pretty narrow: my group of friends, people I went to school with and people living in my area so Facebook ads were right up my alley. Identify Your Website's Target Audience. What good is being able to target any demographic you want if you don't know the right demographic to target? Sit down and figure out who your current readership is, if that's who you want it to be, and if not, who you do want to target with your ad. My current readership is mostly male. I write (what I think is) comedy for everyone and I didn't see any reason why girls wouldn't find what I have to say funny too. So I decided to target females in the area. Tailor your ad to your target audience and your target audience to your ad. You don't need to limit yourself to one ad per campaign. Create several that target different groups of people within your target audience. Would liberals respond better to one ad and conservatives to another? Would people over 50 respond differently than twenty-somethings? 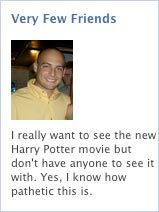 My ad was for a blog post about trying to get a date for the new Harry Potter movie on Facebook. So I targeted only people who are both single and list Harry Potter as one of their interests. I thought about creating an ad for Transformers and Ice Age too but I had to draw the line somewhere with how desperate I could look. With Facebook ads you're gauranteed to get a lot of impressions. What you're not guaranteed is that you're going to impress your target audience enough to get them to click on your ad. So when someone glances at your ad, the first thing they look at (usually the headline) needs to be intriguing enough to get them to read the rest of the ad. Choose your words carefully though because you only have 25 characters. I went with "Very Few Friends" because it's unexpected. Most people try to hide the fact that they don't have many friends. Not advertise it to thousands of people on Facebook. You have 135 characters to convince a slightly-intrigued member of your target audience to click on your ad and see what you're really about. Make your point succictly and sincerely. If someone is reading the body of your ad, they're at least marginally interested in what you have to say. Reward them by being straightforward. I finished my ad with "Yes, I know how pathetic this is." because I thought it gave the ad a sincere, human feel. Also, I thought it was funny. I like to utilize CPC when it's available. It's more expensive than CPM but it ensures that you'll get a certain amount of clicks to your site. However, you should monitor your click through rate. If you are getting enough clicks that your CPM is significantly higher because you're paying for each click instead of by every thousand views, then switch. I started with CPC but changed after a few hours of higher-than-I-expected click through rates to maximize my budget. But I'm sure that's not all. Do you have any other advice for people placing ads on Facebook? Let me know! Note: My personal blog in no way represents the views of New Media Campaigns. I'm glad to hear that you found the case study useful. I agree with your theory in your recent blogpost (http://noel4nopun.blogspot.com/2009/07/advertising-on-facebook.html) that one could use Facebook ads to test the common strategy of narrowing your target audience to a single, if hypothetical person. That's a great use of Facebook ads and one I hadn't thought of.